The Olympic site was built by Günther Behmisch, Frei Otto & Partners and became world-known mainly because of the futuristic tent-like roof construction. 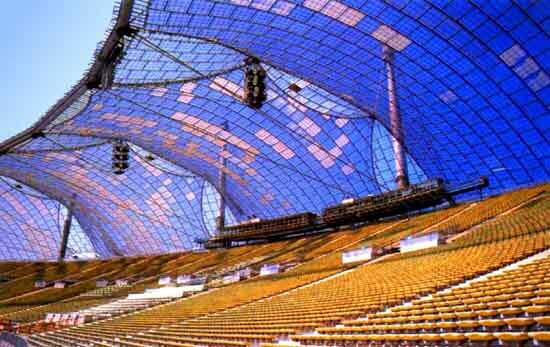 The transparent acrylic glass “tent” roof over the Munich Olympic Stadium, Germany, measures 85,000 sq m (915,000 sq ft) in area, and rests on a steel net supported by masts. The Olympic stadium can seat 80,000 people and the Olympic hall 14,000.